Malaria is caused by a parasite spread by blood-sucking mosquitoes. The rapid spread of “super malaria” in South East Asia is an alarming global threat, scientists are warning. The team at the Mahidol-Oxford Tropical Medicine Research Unit in Bangkok said there was a real danger of malaria becoming untreatable. Prof Arjen Dondorp, the head of the malaria unit, told the BBC News website: “We think it is a serious threat. In a letter, published in The Lancet Infectious Diseases, the researchers detail the “recent sinister development” that has seen resistance to the drug artemisinin emerge. There have now been “alarming rates of failure”, the letter says. Prof Dondorp added: “It’s a race against the clock – we have to eliminate it before malaria becomes untreatable again and we see a lot of deaths. 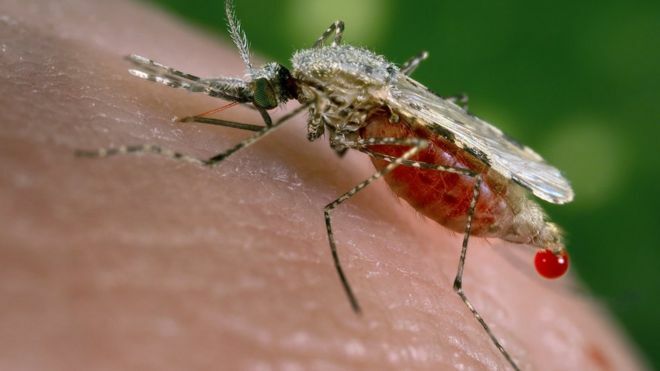 Michael Chew, from the Wellcome Trust medical research charity, said: “The spread of this malaria ‘superbug’ strain, resistant to the most effective drug we have, is alarming and has major implications for public health globally. “Around 700,000 people a year die from drug-resistant infections, including malaria. I think that many people these days think it is a good idea to improve their microbiome – the beneficial gut flora who help to not only digest our food properly but to provide our immune system – some say 80% of the immune system is in the gut. It seems a good idea – we’ve all known someone who germs just wouldn’t touch (sometimes we may be tempted to say it’s because of their personality – ‘No decent germ would go near X’ for example! And they are often quite a bit smug about their ability to avoid infection…) But it is really more likely to be that they have a really good immune system based in their gut. Once we’ve done that, we can look at other ways of hopefully avoiding infections and fighting these superbugs which seem to be getting everywhere.